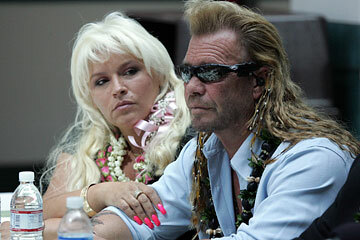 Beth and Duane Chapman were taken off a flight Monday after police were called. Reality television stars Duane "Dog" and Beth Chapman were taken off a United Airlines flight Monday morning after they yelled and swore at a flight attendant, Los Angeles airport police said. Police were called to Gate 68A about 8:05 a.m. Monday. According to a report of the incident, the Chapmans were disrupting the flight by being loud and using profanity. United Airlines Flight 386 from Los Angeles to Denver returned to the gate "shortly after pushback because of a disruption of the flight because of passengers," said airline spokeswoman Robin Urbanski. "The disruption on the flight affected our other customers on the flight and our safety regulations." Urbanski said there were 156 passengers on the flight and it departed about 43 minutes late. Airport police interviewed the flight attendant, who requested the Chapmans be removed. No one was arrested, and Duane, Beth, Timothy and Leland Chapman were rebooked on another flight to Denver. Duane Chapman thanked the officers for responding and apologized, but Beth Chapman had no comment, police said.